Ten unexplored dungeons in the north of the Sword Coast and a party of eager adventurers is the recipe for an exciting evening. Delve into abandoned chapels, beleaguered mines, haunted barrows and demon-infested crypts. Put an end to evil machinations, unearth ancient treasures, or perish by the hands of your enemies. 10 dungeons, a total of 24 maps in different versions for the DM and players, 24 custom monsters & NPCs and 12 new magic items! The dungeons all include plot hooks and advice on how to continue the adventure. Breve Heeros Onli! by George Sager: Mount Black. A mountain filled with a myriad of creatures’ lairs, a crippled dragon that wants to control it once again, and a friendly kobold who can guide you to glory - for a price. - This adventure is designed to be incredibly flexible and can be run for 4-7 7th to 15th level characters. 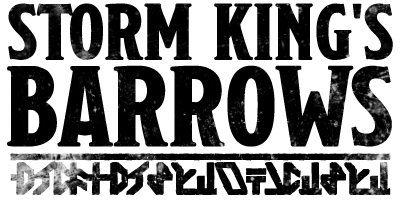 The example provided is optimized for 4 characters with an APL of 7. Mount Black is designed to be found anywhere within the northern mountain range. One place it can be found is 50 miles north of Mirabar, rising forebodingly higher than any of its neighbouring mountains. 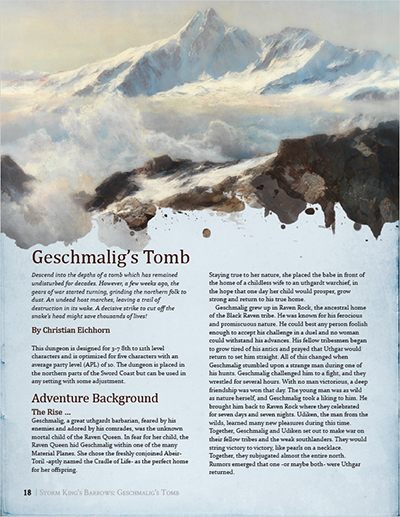 Geschmalig’s Tomb by Christian Eichhorn: Descend into the depths of a tomb which has remained undisturbed for decades. However, a few weeks ago, the gears of war started turning, grinding the northern folk to dust. An undead host marches, leaving a trail of destruction in its wake. A decisive strike to cut off the snake’s head might save thousands of lives! - This dungeon is designed for 3-7 8th to 12th level characters and is optimized for five characters with an average party level (APL) of 10. The dungeon is placed in the northern parts of the Sword Coast but can be used in any setting with some adjustment. Grotto of the Death Giant by Eddie Gioffre: In the foothills of the Sword Mountains lies the prison tomb of a long-forgotten giant deity. What does it have to do with recent caravan raids along the trade route between Waterdeep and Neverwinter? One group of daring explorers just might find out. - Grotto of the Death Giant is a location-based adventure designed for 3 to 7 1st to 4th level characters and is optimized for 5 characters with an average party level (APL) of 4. Saving Barbadoo's Mine by Matt Butler: Explore a mysterious and deadly mine filled with a brand new magical substance called brightsteel. Do you have what it takes to save a wealthy cloud giant from his deadly fire giant rival and earn his favor? - This dungeon is designed for 3-5 8th to 10th level characters and is optimized for 4 characters with an average party level (APL) of 9. The dungeon is placed in the northern parts of the Sword Coast near Neverwinter but can be used in any setting with some adjustment. Stone Giant's Lost Rock by Micah Watt: A crafty xorn stole from the giants and dwarves alike. Their most precious relics are hidden away in its lair, waiting to be recovered by a band of fearless adventurers. However, the xorn was a mere pawn in the machinations of a ruthless woman... - The adventure is designed for 4-6 characters of level 3 (Tier 1, APL 3) but has notes for adjusting to fit higher or lower power parties. DMs familiar with Storm King's Thunder will be aware that the action in Nightstone theoretically takes characters from level 1 to level 5, but unless using the milestone system this is not achievable with the available challenges. Stone Giant’s Lost Rock can be used to bolster lower level parties after Nightsone, or it can be scaled to 5th level characters using the Very Strong guidance. The Barovian Book Of The Dead by Andrew Dempz: Claustrophobic terror awaits as the dead rise from the earth, trapping the adventurers in the Last Standing Chapel! - This dungeon is designed for 3-7 8th to 10th level characters and is optimized for five characters with an average party level (APL) of 9. The Great Worm Caverns by Christopher Walz: The heroes uncover the secrets of an Uthgardt tribe while contending with dark magic and draconic forces in this action-packed dungeon crawl. This adventure is designed for 5 9th - 11th level characters and is optimized for five characters with an average party level (APL) of 10. Each encounter provides options for weaker or stronger parties. 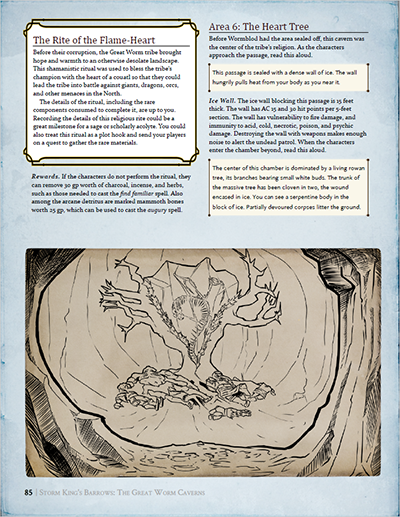 The Great Worm caverns are presented in Storm King's Thunder, page 88. This version of the dungeon, however, is much larger and meant to be a prominent setting for adventures in the North. If the Great Worm tribe interests you, then consider using this expanded version to flesh out your campaign. The Tomb of Mild Discomfort by Jason Bakos: Centuries ago, two powerful wizards clashed. Emerging victorious, Acererak the Eternal built a tomb for his fallen opponent, Queen Azaria the Arcane. Now, years later, you dare disturb the peace of her resting place, only to find that the traps are not as much deadly as they are mildly discomforting. - The dungeon is placed in the northern parts of the Sword Coast but can be used in any setting with some adjustment. The dungeon is optimized for five characters with an average party level (APL) of 6. A dungeon exploration adventure packed with fun traps, clever puzzles, and spicy encounters that will get you excited! 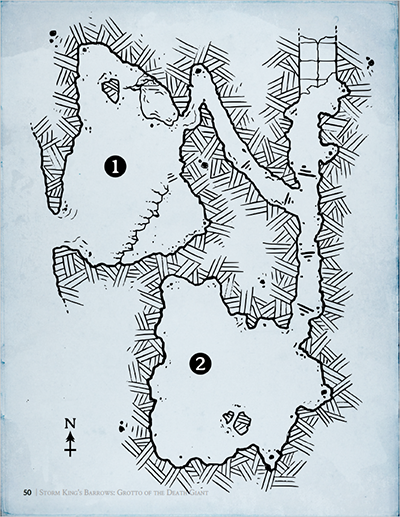 The Vault of the Undying by David Flor: Recent tremors of unknown origin have shaken the area just south of Raven Rock, revealing a long-forsaken crypt that has been buried underneath the snow and ice for nearly a century. Many have tried to enter the crypt, looking for fame and fortune, but all have been sent fleeing due to some unknown terror beneath the surface. If there are riches to be had within the crypt, no one has seen them. - The Vault of the Undying is a short adventure optimized for a party of 5 characters of 7th - 8th level. It can be loosely tied in to the events of Storm King's Thunder or it can stand alone in the campaign setting and environment of your choice. Yancazi's Crypt by Darren Parmenter: The place commonly known as ‘The Warlock's Crypt’ is the final resting place of the warlock, Orfeon Yancazi, a worshipper of Demogorgon until he overthrew his master. At least, that's how history tells it. In truth, Orfeon Yancazi failed to destroy Demogorgon and was thus punished, his form being transformed into the likeness of his patron and his mind just as twisted. He became imprisoned within his crypt by those he once called friends. - This dungeon is optimized for 5 10th level characters. Characters adventuring into the crypt will be required to uncover a ritual to discover the true nature of what lies within. The characters will either need access to someone that can read Abyssal script or be accompanied by Victor Lentori, to complete the adventure. If you have any questions write an e-mail (christian.eichhorn.dmg@gmail.com) or search for my Twitter handle @squirrelgolem. Very happy about this, thanks for bringing this out! As I am currently running SKT my PCs are getting towards the end of "Grotto of the Death Giant", there is something not completely clear to me. There is a mention of the "Black Heart of Karontor" (also: typo on p48 where it says "Karontar") but it does not say where it is. Is this on purpose? The adventure just states, that it glows when the avatar is hit with magic. Thanks again for all your work, I really like every single part of it! As the author, my intention was that the Black Heart was located on the ledge in Room 7. The PCs should be easily able to shoot ranged attacks at it for almost anywhere in the room, but there is one rough stairway up to the ledge where the various Room's creatures might try to block and attack any melee attackers. Any chance of a print version? Hi Stephanie, thanks for buying! ;) Regarding your question, there is only a slim chance. The layout is done with GMBinder which does not produce a PDF file usable for a POD title. And POD isn't an option per se (at the moment). OBS has the final say whether a title gets a POD version or not. However, I'm certainly all for it and maybe if a version 2.0 is released at some point in the future it will available as print. Wow! The production values on this badboy are through the roof!!! Thanks! I know Christian put a ton of work into the production.